When you hear the word “chemotherapy,” most people think of a particularly potent cancer treatment. While they aren’t wrong, chemotherapy can also be used to treat lupus, which many people heard about for the first time when actress and singer Selena Gomez told the press she received chemo treatment for her lupus. Chemotherapy is typically reserved for more aggressive forms of lupus and may be taken over the course of several months. There are three major chemo medications for lupus that are given to patients. Mycophenolate mofetil (commonly known as CellCept) was originally created for recent organ transplant recipients. CellCept works by lowering the immune system (thus making it work for lupus patients whose immune system is in overdrive), and for its original purpose, helps a patient’s body adapt to a new organ and not reject it. 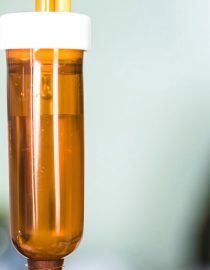 The dose a patient receives depends on the severity of their lupus and it may be taken in conjunction with a steroid to stabilize the patient even further. Though most people think of hair loss as the number one side effect of chemotherapy, the drugs given to lupus patients do not typically make patients lose their hair. Instead, lupus itself and other treatments for lupus can cause hair thinning and loss, though no two people with lupus suffer the exact same symptoms. Because of the strength of this medication, it is not recommended that pregnant women take it. In fact, it is required that women have a negative pregnancy test before undergoing treatment with CellCept and should not attempt pregnancy for six weeks after ceasing the medication. The most common serious side effect is infection, which you must notify your doctor of immediately if you begin to notice the signs of one as this may become life-threatening. Many doctors will ask that patients take regular blood tests to ensure the CellCept is not doing further damage to the body. Patients taking CellCept for lupus may have to wait several months to notice big changes to their health or to be able to tell if they are benefitting from the drug. There is also a suggestion that people who take CellCept may be at a higher risk for developing cancer, however people who need to take it may already be in the pool of “increased risk” before they even begin the chemotherapy. It is also recommended that patients who take CellCept wear sunscreen and avoid prolonged sun exposure, however if you’re already a lupus patient, you’ve likely already got that one covered. It is also important you attend and keep all regularly scheduled appointments with your doctor as this medication is particularly strong.